As we kick off 2019, polio workers continue their tireless work to reach children everywhere with the lifesaving polio vaccine, to eradicate this scourge once and for all. While the world had hoped to be rid of this disease in 2018, the year saw a number of key milestones to bring us ever closer to that reality. From endorsing the forward-looking Post Certification Strategy to stopping the Syria outbreak, leaders across the globe are working together to root out the virus along borders and safeguard polio-free countries from potential reemergence. As 2018 came to an end, health workers worldwide strategically vaccinated children in hard-to-reach areas, sometimes ahead of schedule, doing whatever it took to keep children protected. With the end of the Endgame Plan 2013-2018, the GPEI is working with stakeholders to present a 2019-2023 strategy to the World Health Assembly. This plan builds on the lessons learned since 2013 and lays out a clear roadmap to achieve global certification and secure a lasting polio-free world once and for all. *Data as of 30 January 2019, compared to the same point in 2018. The programme reflects on important progress over the last year in the challenging last mile of polio eradication. 2018 was marked by expanded efforts to reach children with vaccines, the launch of innovative tools and strategies, critical policy decisions and renewed donor commitment to the fight. 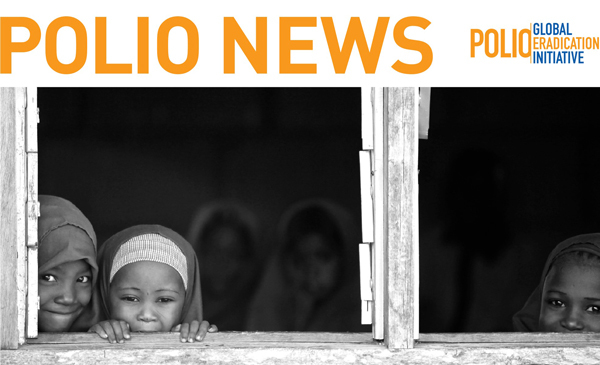 Learn more about the Global Polio Eradication Initiative’s efforts. The WHO Director General kicked off the new year with visits to Pakistan and Afghanistan, the two countries that reported cases of wild poliovirus in 2018. As new Chair of the Polio Oversight Board, Dr Tedros demonstrated WHO’s commitment to eradication by meeting with Prime Minister of Pakistan Imran Khan and other high-level government officials from both parties. Read about his trip. In an extraordinary joint statement, the Chairs of the main independent, advisory and oversight committees of the GPEI urge everyone involved in polio eradication to ensure polio will finally be assigned to the history books by 2023. The authors are the chairs of the Strategic Advisory Group of Experts on immunization (SAGE), the Independent Monitoring Board, the Emergency Committee of the International Health Regulations (IHR) Regarding International Spread of Poliovirus and the Global Commission for the Certification of the Eradication of Poliomyelitis (GCC). The statement issues an impassioned plea to everyone to dedicate themselves to one clear objective: to reach that very last child with polio vaccine. Building health security into health systems: one legacy of polio eradication that must not be lost. WHO Bill Gates: the best investment I've ever made. Spain has provided €50 000 to WHO for polio eradication efforts worldwide. Germany’s extraordinary support to GPEI was reaffirmed in December 2018 through contributions to the three polio endemic countries: €10 million to Afghanistan, €15.5 million to Nigeria and €5 million to Pakistan. As a part of its long-term, multi-year commitment to global effort for polio eradication, the Government of Luxembourg disbursed €500 000 in 2018. The United Arab Emirates continues its strong support to polio eradication operations in Pakistan and has contributed US$ 2 048 934 to the UAE-Pakistan Assistance Programme. Canada has provided Can$ 1.5 million to WHO as part of its Can$ 15 million contribution to polio eradication operations in Afghanistan.